Bidawee farm was established in October of 2001, when Sharon and Emmett Miller purchased a farm in historic Bealeton Virginia. 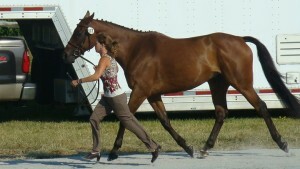 The farm was primarily purchased to retire Sharon’s competition horse, Strawberry Iceman “aka ” Boone. Boone was born in June of 1989 and he is still enjoying his retirement days, grazing in the fields with his friend Bubbie. Bidawee, named by Sharon’s mother, means “rest a little”, a word used by the Scottish at Welcome Inns in Scotland. In the US we refer to Welcome Inns as B&B’s (Bed and Breakfasts). 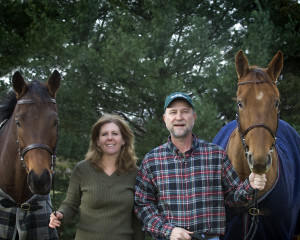 Since it’s inception, Sharon and Emmett have developed Bidawee Farm into a first class equine training ,boarding, and sales facility, always putting the safety, comfort and well being of the horses first. The farm hosts gently rolling conditioning fields for hacking and galloping, and a 180 X 190 all weather sand arena. These are a few features of the farm that make Bidawee Farm a wonderful place to bring along a horse in any discipline. Sharon is an upper level event rider that has completed both a CIC* and the CCI* at the International level on a OTTB she started as a 4yr. old and took up the levels herself .Sharon takes great pride in the ability to bring along her own horses from the “starting gate” to the start box ! . 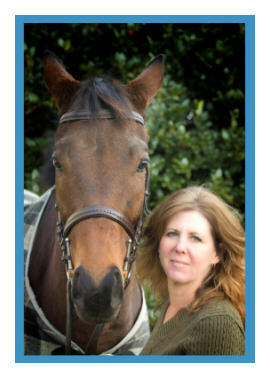 Although Sharon focuses her career path towards eventing, she has bought along numerous successful horses in a variety of disciplines, including fox hunting, show jumping and children’s mounts, just to name a few . Sharon believes in solid basics from the beginning, to build a foundation to last a lifetime. Sharon has been on a horse since the beginning of time. There are family videos of her being led around on her uncle’s horse Apache that date back to before Sharon could stand on her own . She started riding on her own at the age of 5 when her mother bought her first pony, a black and white pinto mare, named Pixie (Pixie Land was the pre-school she attended.) 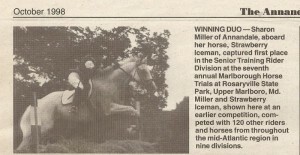 So the love affair with horses began…. At the age of 10 Sharon partnered with a horse named Rebels Ghost aka “Marble”. He was purchased from a back yard rent-a-horse stable . No one wanted to rent him as he was a lot of horse with a go button close to the surface ( I suspect he had a little TB in him ). 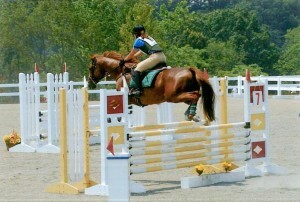 Rebel was the horse that gave Sharon her first taste of competition. Since the early riding days Sharon has been mentored by many wonderful people, lessoned with some of the best instructors in area II and clinic’d with Olympians including Jimmy Wofford, Lucinda Green, and Stephen Bradley. Sharon’s last several years have been strongly influenced by Lynn Symansky, USA 2014 WEG team member and 2011 Pan Am, gold medalist and Kurt Martin, advanced rider, recently chosen for the USEF 2014 winter training sessions with David O’Conner. Sharon can not thank these two enough and is grateful for the support . Sharon she is truly blessed to have such a wonderful opportunity in life, to live out her dreams !! Please contact us with questions about any aspect of the business. We’re always happy to hear from fellow horse lovers. 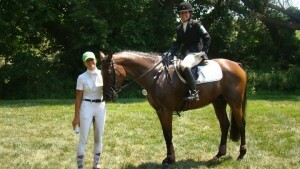 Loverboy and Sharon Miller at the MD horse trials. The training program involves a strong emphasis on flat work and dressage basics. Also a well rounded education goes into grid work, gymnastics, and stadium jumping, trail riding , field work, cross country schooling, and hound introduction for horses with that aptitude for Fox Hunting.